This is a special page for primary schools working with FSW. It should be used in conjunction with the worksheet which can be downloaded from here. Summer time is the best time to learn about the deciduous trees in Selsdon Wood. These are the trees that lose their leaves in the winter time. Six of the most common trees are described below. 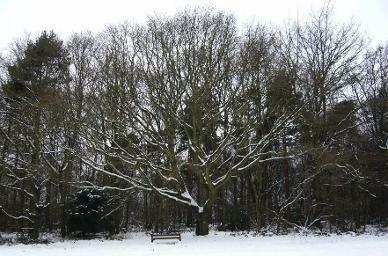 Oaks are the most common trees in Selsdon Wood and can be found in all parts. Some of the Oaks are very old and one of the largest is in The Great Field on the edge of Steven's Larch. The photographs below show this tree in summer and in winter. This tree is over 100 years old and shows the typical rounded shape of an Oak tree. There are lots of younger Oak trees in the Centenary Plantation. In 1983 one hundred Oak trees were planted here to celebrate the 100th birthday of Croydon Council. 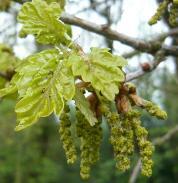 The flowers of the Oak tree are green catkins that grow in spring and the fruits are acorns that grow in little cups and fall off the tree in the autumn. 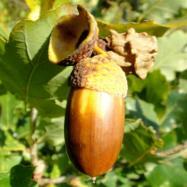 The acorns are dispersed by squirrels, jays and other animals. They gather the acorns for food and take them to other parts of the wood to store for the winter. The ones that do not get eaten can then grow in new places. There are two different kinds of Oak tree in the wood. 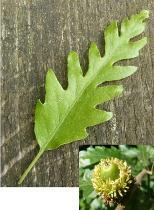 The old one in the Great Field is an English Oak but there are also Turkey Oaks which have a different shaped leaf and hairy acorn cups. Ash trees are also common in Selsdon Wood but not as common as the Oak. There are Ash trees at the top of Green Hill and in David's Crook. Full grown Ash trees can be taller than the Oaks and show above them in the skyline. 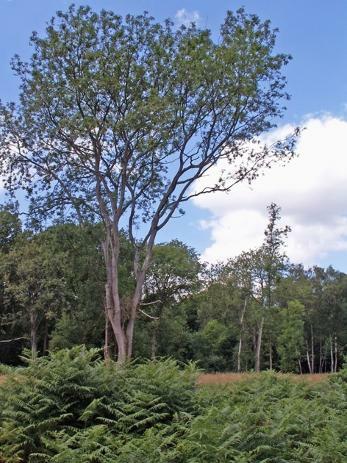 They are not as rounded as Oaks and have more of a fan-like shape. 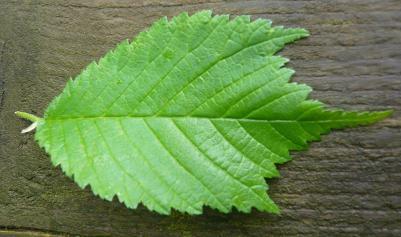 The leaf of the Ash is called a compound leaf because it is made up of lots of small leaves coming from a single stalk. There may be between 4 and 7 pairs of leaves and there is always a single one at the end. 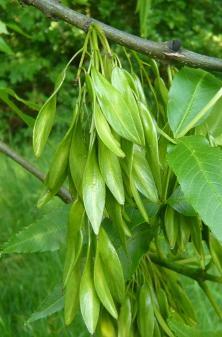 Lots of Ash trees could die because of a new disease called Ash Die-Back. This causes the leaves to shrivel up and the bark to crack. Luckily there have been no signs of the disease yet in Selsdon Wood. 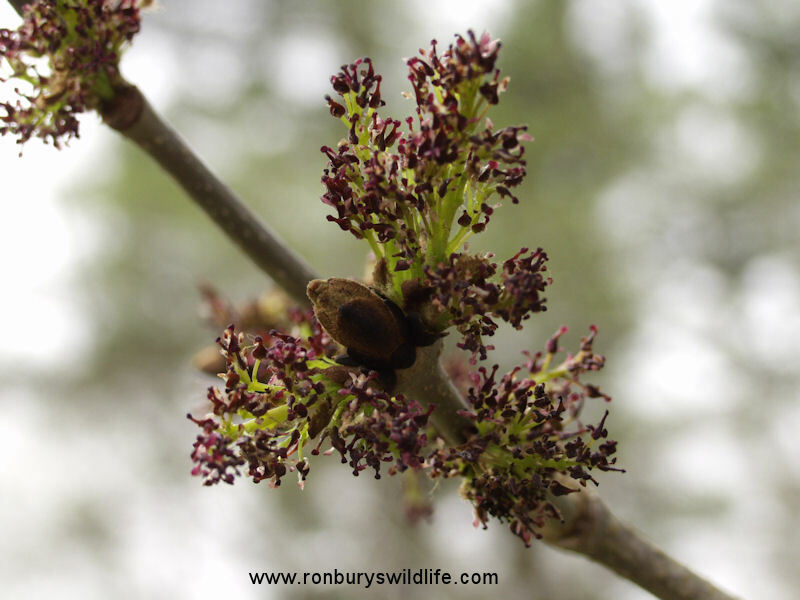 The flowers of the Ash tree are purple and fluffy and grow in early spring from black buds. The fruits are keys with a single twisted wing. The twist causes the keys to spin in the wind when they fall from the tree dispersing the seeds over a large area. 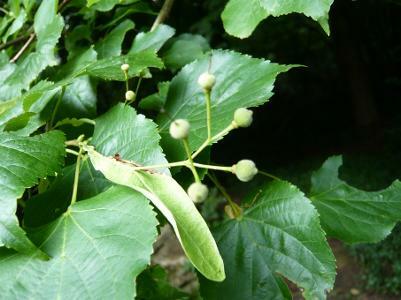 The keys are green at first but turn brown when they are ripe and can often be seen on the trees for most of the winter waiting for a strong wind to blow them far away. 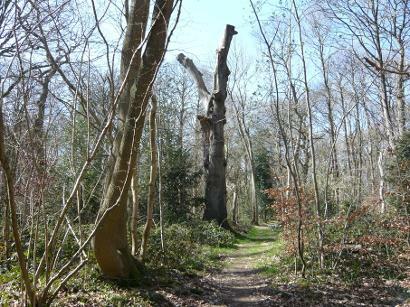 Beech trees are found all around Selsdon Wood but are not as common as Oak or Ash. There are some young ones in the Jubilee Plantation. One of the biggest Beech trees in the wood was over 100 years old. It was cut down a few years ago because the branches were unsafe but the huge trunk was left as a home to insects and birds. 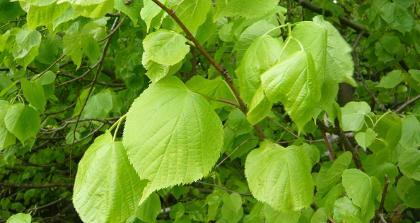 Beech leaves are a bright green when they have just opened and look very beautiful with the bluebells. They are oval shaped and smooth and have a hairy fringe that falls off as the leaf grows. 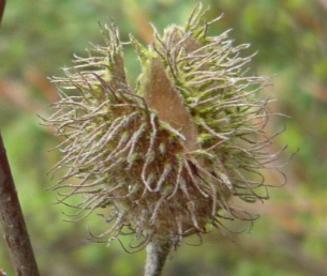 The fruit is a bristly box called a cupule which splits open and throws out one or two seeds. These are eaten by badgers and other animals. Squirrels gather them for food and take them to other parts of the wood to store for the winter. The ones that do not get eaten can then grow in new places. However, most of the Beech trees in Selsdon Wood are quite young and do not have flowers or fruit as Beech does not produce these until it is 30 years old. There are two kinds of Beech in Selsdon Wood. As well as the ordinary green Beech there are four Copper Beech trees in the strip of woodland between Field 2 and Field 3. There are very few Elm trees in Selsdon Wood. 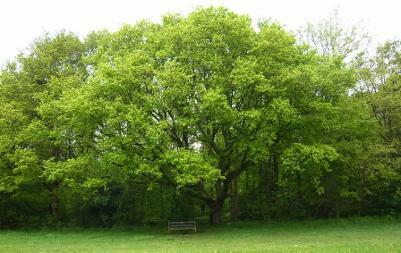 Elm trees are quite rare in Britain because they have been killed by a disease called Dutch Elm Disease. The disease is spread by a beetle that lives in the bark of the tree. The best Elm to study is growing close to the Jubilee Plantation. 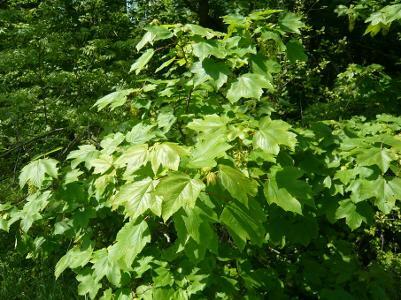 The leaves are larger than Beech leaves and have thick ribbing underneath that is rough to touch. 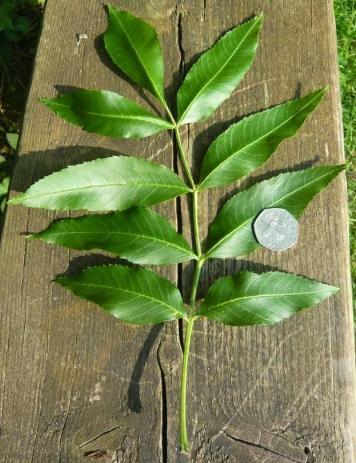 Most of the leaves are oval but some leaves near the end of the twigs have three points. The trunk is straight with grey bark covered with rough holes. 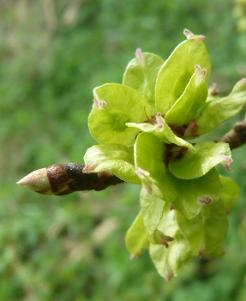 The green flowers are produced in bunches of blossom before the leaves open. 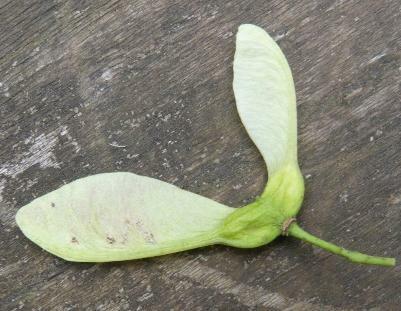 They develop in late spring into a small oblong fruit, called a samara with a seed in the middle surrounded by a thin envelope that acts as a wing to distribute the seed in the wind. There are six Lime trees in Linden Glade. They are grouped around the bird pool and were planted about 30 years ago. Linden is an old fashioned name for the Lime tree which is how this place got its name. There is only one other Lime in the wood and that is in Field 3. The wood of the Lime tree is not much used today but it was used in olden days for building, furniture, carving, firewood and rope-making. Monks kept their bee-hives beneath the trees so that the bees could use the flowers of the Lime tree to make honey and the monks used the flowers to make medicines and tea. 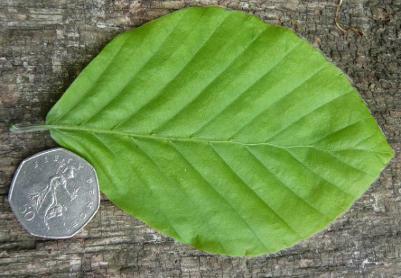 Lime leaves are heart shaped with toothed edges and are a bright green colour. The fruit are clusters of round green berries with a wing shaped leaf attached. This is called a bract and helps with dispersal as it is like a wing and can be blown by the wind far away from the parent tree. There are lots of Sycamore trees in Selsdon Wood. Most of these are quite young and there are not many fully grown trees standing on their own. Most are seen as bushes in the hedgerow rather than tall trees. The leaves are large and easily recognised. They have 5 lobes with wavy edges and a pink stem. The fruits are keys. These are quite different from the keys of the Ash as they have two wings while those of the Ash have only one. However they work in the same way as they sail away in the wind when they fall from the tree dispersing the seeds over a large area. The keys are green at first but turn brown when they are ripe.